Somebody told me today about this website. I have joined, and have arranged to go to two social evenings already over the next couple of weeks - I also have arranged to meet another lady for a dog walk and a cup of coffee at the weekend. How cool is that? 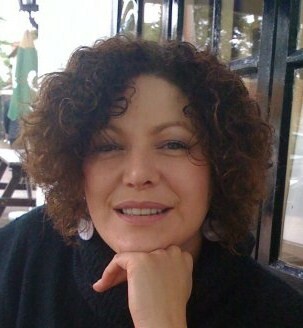 My Mum - bless her heart - has taken me in and made me welcome, fed me, and looked after me and Millie. My Auntie Mimi has phoned me every single morning to tell me how wonderful I am - and how I can do anything that I want - and how special she thinks I am. 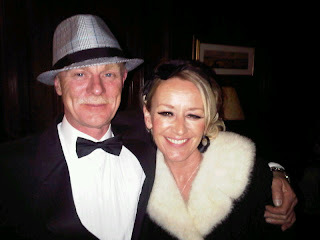 This is me and one of my dearest, oldest friends, Pete, all dressed up on Saturday night. I was Dusty Springfield, and he was Frank Sinatra. Actually I was me and he was him - but you know what I mean.....A good night was had by all, lots to drink, great company, many many laughs, and a late night (early morning) made all the later because the clocks went forward! I have a special friend called Liz. That wasn't her name when I first met her - but that's a whole other story. I met her via somebody else - and the first time we met I got quite drunk and broke a wine glass. Funnily enough this must have struck a chord with her - because from that moment on we got on like a house on fire. She likes a drink or two does Liz!!! We had a day Christmas shopping together last November (2008)- which was a blast - and from that day on we've been really good pals. Anyway I am writing about her because she said to me today that I hadn't ever written anything about her. I explained that I don't often mention people by name on here - because it's a sensitive thing - people might not want stuff about them splashed all over t'internet for any random Joe somewhere in the world to read (clearly I don't mind that!) But she said that she would actually like to get a mention. I have a lot of pals - as you may know - and over the last few weeks they have all been brilliant - supportive, caring, and there for me. But Liz - well Liz has been amazing. She has called me every day without fail since the 6th January. (Actually she called me nearly every day for a full year before that too). She has offered support, ideas, a shoulder to cry on - and have given me a stern word or two when I have needed it. She has never wavered in her support and care - and I wanted to take this opportunity to thank her for all she has done and how she has been. She is also quite mad - and very very funny. Every time I talk to her she makes me laugh out loud - usually more than once - and even in my darkest moments she has managed to cheer me up, and made me see sense. Dusty Springfield has to go and start getting ready in a minute. There is hair to backcomb, false eyelashes to adhere, and a lot of black eyeliner to apply. I've just had a call from Frank Sinatra, and he's picking me up at 7!! Yesterday I purchased false eyelashes - you just know it's all going to go horribly wrong... don't you? I have been to see the tenants in my little house today. I had to ask them to move out, because I want to move back in. Apparently Belvoir - who manage the letting on my behalf - haven't been passing messages on. AND - when the tenant moved in they took six months rent up front from them!...and they told the tenant that I insisted on that as a condition of them moving in! Bloody Cheek. But you know what? I do now! I've just been away as I said in my previous post. Whilst away I met the most incredible person. It's so bizarre how the Universe conspires to introduce you to interesting and fascinating folk. When I arrived in Gozo late on Thursday I went to my friend Julian's apartment. He has people who visit the dive school staying there, divemaster trainees and people taking other courses etc. On Friday morning I was up early drinking coffee in the living room when this guy walked in wearing just his shreddies (underpants)...he looked rather the worse for wear and spoke with a pronounced scally-scouse accent. He had a shaved head and to be quite frank - resembled a burglar. Not being one to pre-judge I bid him a cheery 'good morning' and was grunted at in reply.! He then disappeared into the bathroom, and Julian and I set off for the dive shop. A couple of hours later - this same guy strolled into the dive shop (by now he was fully clothed). Julian introduced him as Simon, and a few minutes later I went two doors down to get us all some coffee. He had arrived to help Julian train a couple of technical divers on a very difficult course. Through the next three days I got to know Simon, and spent a lot of time with him, talking and picking his brains, and on one occasion when we were doing a cave dive and I started to panic a little bit - he immediately spotted the problem and gently guided me out of the cave and then stayed with me to make sure I was okay. It turned out that his name is Simon Townsend, and he is one of the world's best technical scuba divers. He holds world records for deep dives and long dives. Within the dive community his name is synonymous with skill and experience. And there I am - little old 'flipper' me being able to eat with and talk to this chap for three evenings on the trot. Most divers would kill for that opportunity. He is a really lovely guy, totally willing to help and and advise novice divers like me, and spend time talking and coaching them. I leant more in three days than I have in all the courses I have done. Simon is a pioneer in diving, one of those people who researches things and pushes the boundaries of what is accepted and what is safe - so that mere mortals like me can do more...safely. It was a complete honour to meet him.